This article finds an appreciable rate of reduction in poverty at about 1.6% annually between 2004–05 and 2011–12 in the state of Uttar Pradesh, which has been largely in rural areas and that too among SCs and Others and across economic regions. In contrast, the incidence of poverty increased in urban areas of the state by 1.32% during 2004–05 to 2011–12, showing the urbanisation of rural poverty due to lack of remunerative employment opportunities and social security measures. However, poverty in the state is predominantly rural. In 2011–12, around 48 million out of 60 million poor people in the state were living in its rural area. The article estimates the poverty in the state at more disaggregated level of 17 administrative divisions (ADs) with an objective to suggest effective policy interventions and make a concerted dent on poverty. The incidence of poverty varies significantly across different regions and ADs of the state. The Eastern region has the highest poverty incidence, while Western region has the lowest, the latter being the most developed relatively among the four regions. The ADs with high incidence of poverty are Basti, Chitrakoot, Devipatan and Lucknow in the Eastern and Central economic regions, which are highly deprived and need to be targeted for poverty reduction. Along with the absolute levels of deprivations, there is huge inequality in distribution of income and consumption expenditure particularly in urban areas that severely hampers the pace of poverty reduction. In 2011–12, Gini coefficient of consumption expenditure distribution was 43 and 27%, respectively, for urban and rural areas in the state. It is found that regions and divisions with high urbanisation level and better rural connectivity have lower poverty incidence. Thus, given the large share of rural population, improving agricultural productivity and subsequently developing vibrant and integrated urban centres would be a highly effective strategy to achieve the target of eradicating extreme poverty from the state. United Nations. (2015). Transforming the world: The 2030 agenda for sustainable development, Retrieved on July 25th, 2017 from https://sustainabledevelopment.un.org/content/documents/21252030%20Agenda%20for%20Sustainable%20Development%20web.pdf. World Bank. (2016). 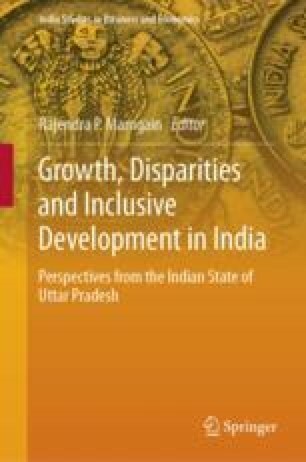 Uttar Pradesh: poverty, growth and inequality, Retrieved on July 26th, 2017 from http://documents.worldbank.org/curated/en/187721467995647501/pdf/105884-BRI-P157572-ADD-SERIES-India-state-briefs-PUBLIC-UttarPradesh-Proverty.pdf.